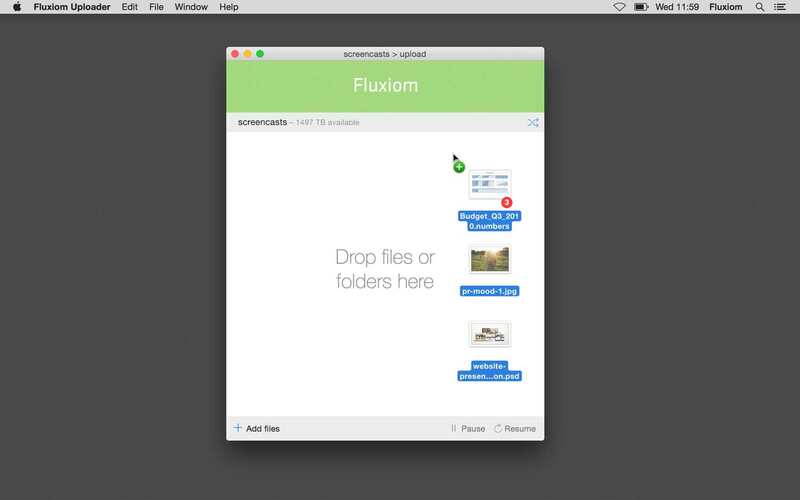 The Uploader is Fluxiom’s unsung hero, enabling you to import assets into your accounts from the comfort of a native OS X application. It is also the perfect starting point for automated workflows using AppleScript, and similar technologies. 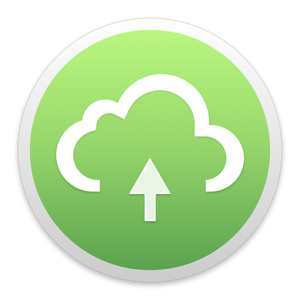 We are psyched to introduce an update to the Uploader, bringing in a fresh new look and a vibrant new icon. 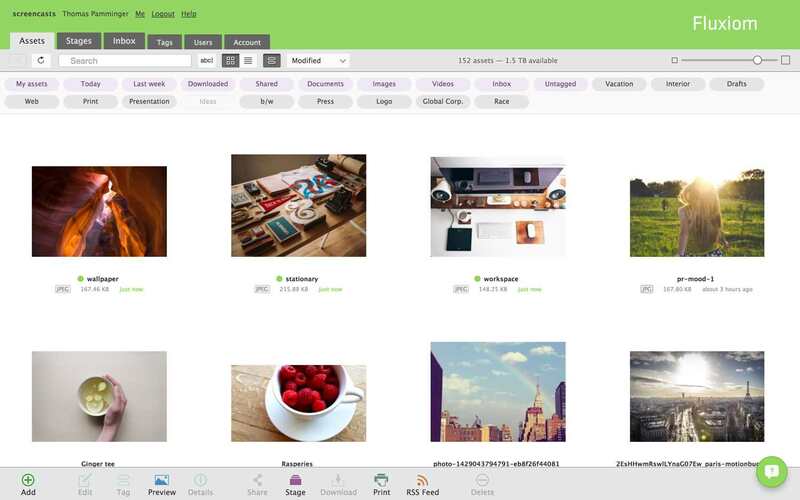 This new version also includes full copy-and-paste support to facilitate uploading large groups of files, in addition to the usual drag-and-drop facilities. This release has been optimized for OS X v. 10.9 Mavericks and later, including the current OS X v. 10.10 Yosemite — and the upcoming OS X v. 10.11 El Capitan. To facilitate large-scale deployments, as well as system restores, it is distributed exclusively on the Mac App Store. It is also fully sandboxed and TLS-enabled, so as to guarantee optimal levels of security. We are already hard at work on further refinements to the application, including new and faster ways to upload data and switch between all your logged-in accounts. In the meantime, we look forward to hearing your feedback. The Assets View is the core of your Fluxiom account. It refreshes in real time, displaying files as they come in. Today, to make it even easier to locate the latest additions to your data, we have started badging the newest files with a small green indicator. It is applied to all new files, whether uploaded by you or somebody else, and it disappears as soon as you reload the view manually. As always, we won’t interfere with your Assets View if you are in the middle of something important. New assets don’t show up if you have actively selected files or are performing a search, meaning there would be nothing for us to badge. In this instance, we will continue to highlight the Reload button to let you know that new data has arrived, just as before. Knowing whom you share your data with, and how, is central to the Fluxiom experience. Today, we are happy to announce deep improvements to our user management interface, all carefully designed to enable faster and more secure sharing. Creating users is now a one-step process. This is by far the deepest change: instead of creating an account and then setting up its privileges, you can do both in a single stroke. This simpler process alleviates any confusion as to what privileges a freshly created user may have on the system. It is now simpler to rescind access rights. You could always do this, of course, by removing a user’s “login rights” from their profile, but we felt the process was needlessly convoluted. Each User Card on the Users tab now features a “Revoke access” button. We now display all users by default, whether they are active or inactive. This simpler design should immediately lift any doubts as to who has (and can have) access to your account. User profiles are simply split into two groups, based on their status. You can now search for either names or email addresses. Search is smart, too, so that partial matches return the results you expect. For example, you can quickly surface every user from a particular company based on email domains. We now support Gravatars in addition to custom profile pictures. This means fewer generic avatars and a more visual experience all around. 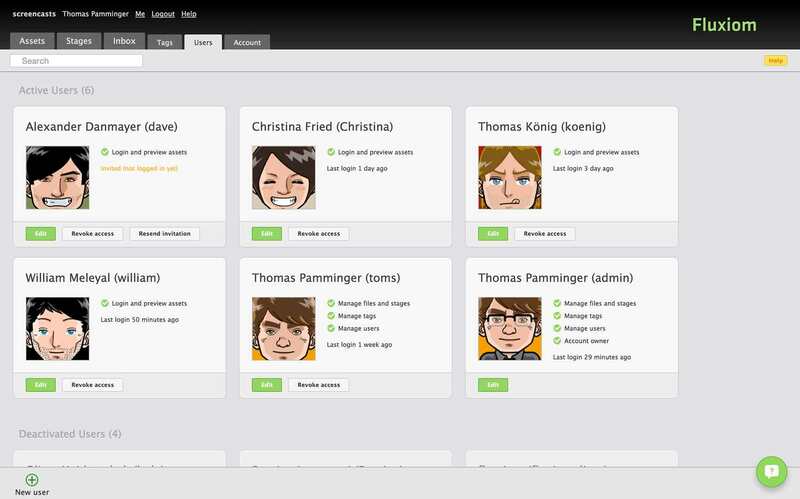 Existing Gravatars are displayed by default until users upload an avatar of their own. Gravatars respect your privacy and update automatically. We hope these improvements to the Users tab help you keep track of your data and those who can access it. They are but the visible tip of a freshly redesigned iceberg and part of our ongoing improvement programme. As always, our support team is ready to answer any question you may have about these new features. The Assets view is the heart of Fluxiom, and almost everything you do on the platform starts there. Because there are many ways to filter your files, including Search and Tags, the view itself has always remained as neutral as possible, listing your files by modified date, showing the most recent first. This default configuration makes it easy to locate your latest uploads, and act upon them quickly. However, it is not without limitations, and we have long wanted to provide more ways to survey your files globally. Today, this dream has become a feature! The new sorting options can be accessed through a simple pop-up menu, located to the right of the Search field. 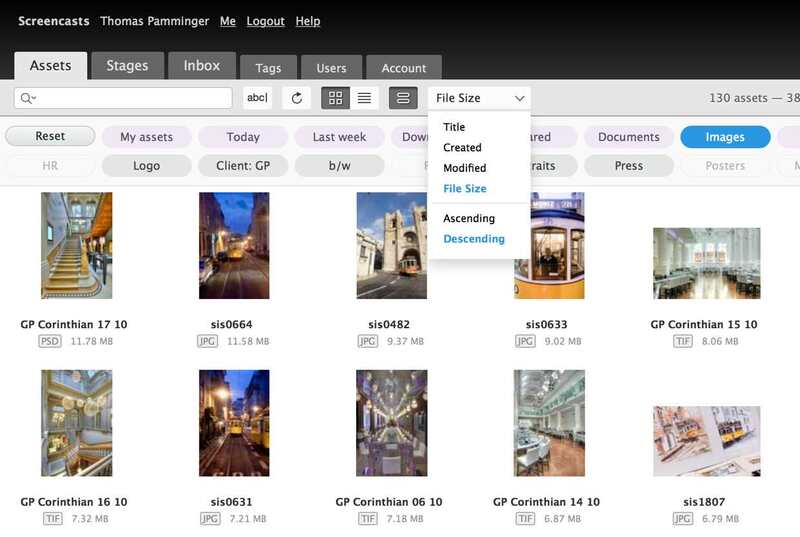 Simply click, and select amongst the sorting options: title, creation date, modification date, and file size. You can also opt to sort the files in ascending or descending order, depending on your needs. The files shown in your Assets view, whether as thumbnails or list items, will immediately shift into position. Active Tag filters, if any, will remain engaged, so that you can combine sorting and filtering at will. A click on the Reset button — located in the Tag bar, as always — is all it takes to restore your Assets view to its familiar defaults. Sorting is available to all Fluxiom users right now, including on Stages. This seemingly small change to the Assets view packs a big punch when combined with our drag-and-drop interface. As a prelude to “rubber-banding” your files to select them, Sorting enables you to act upon your assets with unmatched speed. This will be especially useful to users who are migrating from a traditional filesystem, where it is not uncommon for file names — arranged alphabetically — to carry strong significance. 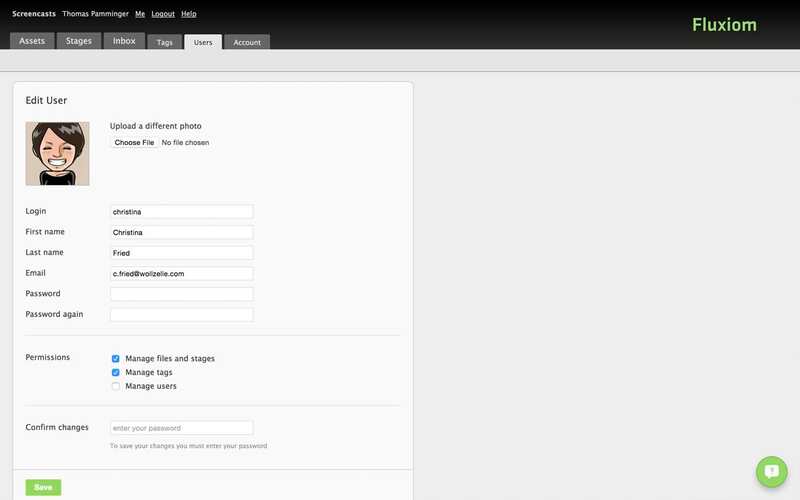 We believe this refinement to the interface will translate into big time savings for our busiest users. We are just getting started, and would love to hear how Sorting influences your workflows — as well as any extra sorting options you wish were available. The team is already hard at work on the next round of improvements but will — as always — keep a keen eye out for your feedback!